Keep Messy Drips and Spills Off Warehouse and Factory Floors. Heavy-duty polyethylene construction � will not rust or corrode. Ribbed bottom keeps cans, pails and other containers elevated above small spills or leaks. 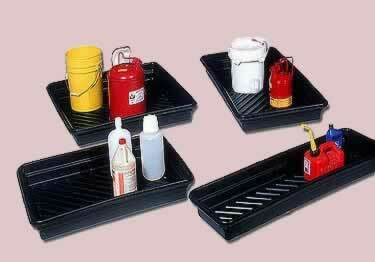 Use for storage / spill containment for leaky machine parts or equipment. Place under trucks or other large vehicles to capture leaks / spills from engines, hydraulics, or other lubricated parts. Nestable for easy storage when not in use. Available in six sizes for a variety of spill containment and maintenance applications. Use for storage / spill containment for leaky machine parts or equipment. I want to use this tray to put under a dog crate for a dog that has severe separation anxiety and drools a bucketful. I am thinking the flexible tray might work if I geti it bigger than the crate. is the yellow flexible tray waterproof? ie if capturing liquid will it capture it or does it leak? What are the heights of your utility trays? I need a tray that is NO HIGHER than 4 1/2". Heavy-duty polyethylene construction � will not rust or corrode. Ribbed bottom keeps cans, pails and other containers elevated above small spills or leaks. Hundreds of shoe-cleaning anti slip scraping ribs. Water & wear resistant, designed to effectively scrape & wipe debris.